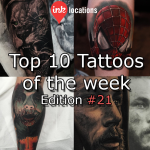 Welcome to the twenty–thirdedition of InkLocation’s Top 10 Tattoos of the week! This week contained a ton of awesome work so it was near impossible to cut down to only 10 pieces, be sure to follow us on Instagram to view all the pieces that weren’t mentioned here. 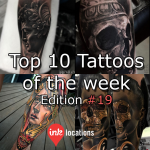 Featuring Carlos Torres (@carlostorresart), Dmitriy Samohin (@dmitriysamohin), Fredao Oliveira (@fredao_oliveira), Goraj (@gorajtattoo), Majorink Jackson (@majorink_jackson), Martin Kukol (@martin_kukol_tattoo_artist), Matt Jordan (@mattjordantattoo), Nikko Hurtado (@nikkohurtado), Rember Orellana (@rember_tattoos) and Sergey Shanko (@sergeyshanko). 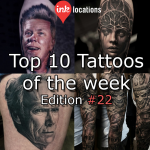 Welcome to the twenty–second edition of InkLocation’s Top 10 Tattoos of the week! This week contained a ton of awesome work so it was near impossible to cut down to only 10 pieces, be sure to follow us on Instagram to view all the pieces that weren’t mentioned here. Featuring Benjamin Laukis (@benjaminlaukis), Dean Taylor (@deantaylortattoos), Eliot Kohek (@eliot.kohek), Karol Rybakowski (@karolrybakowski), Leigh (@leigh_tattoos), Mumia (@mumia916), Pete Terranova (@peteterranova), Ryan Evans (@ryan_evans), Virlan Eduard (@virlaneduardtattoo), Yz Asencio (@yz_asencio_art) . Deciding to get a tattoo and which tattoo artist will do it is a decision and process you should spend a lot of time thinking and learning about. 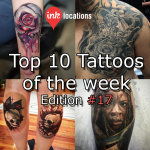 Finding a good tattoo artist is not just about knowing where or who to look for, it’s a long process around the tattoo itself which will lead to the end result you desire. This will help you be happy about the choice you made for the rest of your life, and also ease your nerves going through it all. Just like any industry, there is people that are popular and not greatest at their work, and there’s people that just knuckle down and produce the best results – yet often going unnoticed. While the public perceives these ‘popular’ people as the ‘best’ – this is often far from the truth. Considering the consequences of a bad tattoo, taking the time to learn what and who you need to know is an investment every person should make. In the post below we’ll go through each of the different areas around the process of getting tattooed that you should be aware about. 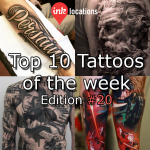 Welcome to the twenty–first edition of InkLocation’s Top 10 Tattoos of the week! This week contained a ton of awesome work so it was near impossible to cut down to only 10 pieces, be sure to follow us on Instagram to view all the pieces that weren’t mentioned here. Featuring Benji Roketlauncha (@benji_roketlauncha), Dmitriy Samohin (@dmitriysamohin), Domantas Parvainis (@domantasparvainis), Jumilla Olivares (@jumillaolivares), Mikael DePoissy (@mikaeldepoissy), Moni Marino (@moni_marino_artist), Rich Pineda (@richiebon), Samuel Potucek (@samuel_tukabel), Sean Foy (@sean_foy), Simone Pfaff and Volko Merschky (@buenavistatattooclub). 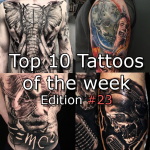 Welcome to the twentieth edition of InkLocation’s Top 10 Tattoos of the week! They are in alphabetical order to keep things fair! 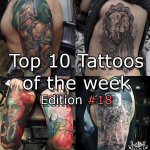 Featuring Alex A.D. Pancho (@ad_pancho), Bolo (@boloarttattoo), Denis Sivak (@sivak_), Giovanni Speranza (@speranzatatuaggi), Levi Barnett (@xlevibarnett_tattoox), Michael Taguet (@michaeltaguet), Mike Randazzo (@mikendazzoart), Orks (@orks_tattoos), Steve Butcher (@stevebutchertattoos) & Tomasz TOFI Torfinski (@tofi_tattoo). If your artist is asking you what colours to use, don’t trust the artist. Of course if you want specific colours for an aspect of the tattoo then that is fine, but if the artist Is asking about every single colour that is going into the tattoo then they don’t know what they are doing as an artist.